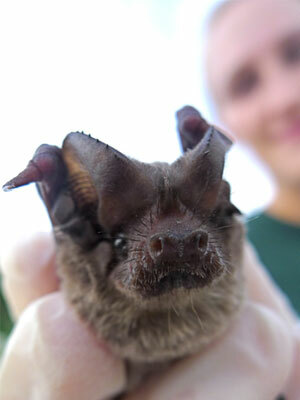 The McCracken lab at the University of Tennessee is known for studying (among other things) the Brazilian free-tailed bat colonies in Texas. While I worked on my dissertation in Knoxville, I spent almost as much time in Texas for fieldwork. But then a curious thing happened — the free-tailed bats came to us! Local teachers reached out when they found bats in their school, and to our astonishment, they were freetails! Why were the bats turning up in Knoxville? We recently published the results of our investigation. It turns out that we were witnessing a range expansion of these bats moving northward and westward from the established eastern US populations, and it was likely facilitated by warming temperatures. Brazilian free-tailed bats have a huge range; they’re found from about 44°N in the western US down to about 42°S in Argentina and Chile. Many of them in the US southwest are migratory, but even in the same location some bats migrate and others do not. Many bats in Texas migrate south into Mexico each year, and we think bats in the eastern US don’t migrate, but we haven’t found any genetic differences between those two groups. The reality is probably very complex (and exciting for bat migration geeks!). 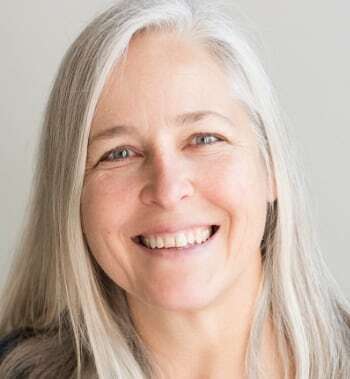 For this study, we looked at records of free-tailed bats found in buildings and bat houses across Virginia, North Carolina, and Tennessee, and collected acoustic recordings in the Knoxville area to verify the extent and timing of their presence. We also looked at bat specimens collected for rabies testing in Tennessee. Finally, we compared genetic samples of bats found in Tennessee and Virginia to samples from elsewhere in the species range to determine if these bats were part of the same population. There was no genetic difference between these bats and those found elsewhere in their established range in the southeastern US. We found evidence of year-round presence of free-tailed bats in the western North Carolina highlands and eastern Tennessee, and that the bats are now moving into Virginia. This expansion appears to have taken place in the last few years. Winter temperatures in eastern Tennessee. There are many instances of free-tailed bats expanding their range in this manner, first appearing as vagrants and then later establishing colonies. In this case, the expansion appears to be aided by warming temperatures. Unlike many other bat species in North America, freetails don’t hibernate, even though they are able to use torpor to withstand cold temperatures. Cold tolerance combined with their ability to migrate makes this particular expansion understandable. The figure to the left shows average minimum temperatures during Dec-February in eastern Tennessee. 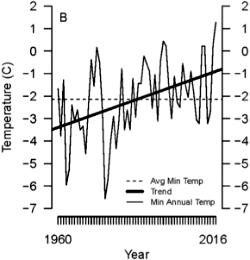 The dashed line is the average temp, and the solid thick line is the trend showing a 2°C increase over that period. 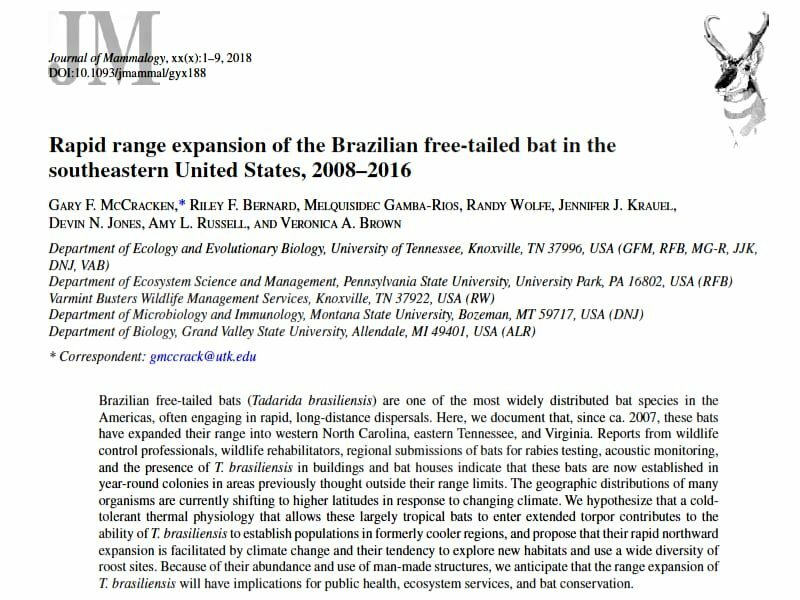 Given this trend, we expect Brazilian free-tailed bats to continue their range expansion into areas affected by White Nose Syndrome. These bats may represent a welcome insect-control service, but may also compete with local surviving species. We don’t know what is going to happen with this kind of radical change to the bat community, but we’ll be watching! Previous Post: « What’s going on up there?